Our Bat House Condo was designed for Bat appeal. ■ 18" high x 10 3/4" wide x 3 1/2" front to back. ■ Center divider creates two 1" compartments, lined on one side with 1/4" square plastic mesh for bats to cling onto. Made in our Tillamook, Oregon warehouse from untreated natural Western Red Cedar. 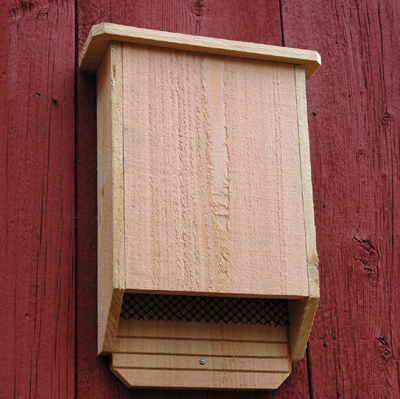 Site Bat Condos high on walls or on 15 ft tall 4 x 4 posts with an open flyaway from trees. Bats like it warm inside, so full sun exposure facing south is preferred.